Everyday is like Sunday: Nails of the...night? Please excuse my manky painting skills(and crappy phone pic)...it's late! 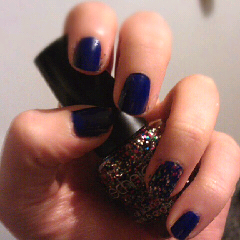 This is Barry M's Nail Paint in Indigo (£2.99) and Technics nail varnish in Carnival(£0.99). Cheap, cheap, cheap! Currently also using Burt's Bees Lemon Butter Cuticle Cream, Barry M Nail Paint 3 in 1 in Clear (nearly out, I've ordered Nicole by OPI Base Coat. Anyone tried it or recommendations for a good base coat?) and Soap and Glory's Hand Food.